This article originally appeared in the fall 2017 issue of The Twig, our 24-page member newsletter. To read more from this issue, click here. To become a member and receive The Twig in the mail, become a member. The story of the whooping cranes’ brush with extinction and fragile recovery is truly remarkable. Unregulated hunting, driven by museum collecting, trophy hunting, and the millinery trade, along with rampant destruction of wetlands, drove whooping cranes to the edge of extinction. In the 1940s and 50s, the species population dropped to about 20 birds. Even optimists had to admit it would be very difficult, if not impossible, to save the species. Then the Migratory Bird Treaty Act of 1928 and the Endangered Species Act of 1973 made it illegal to shoot whooping cranes. Conservationists began to protect key wetlands for the last remaining wild flock of whooping cranes, which still exists today. It is called the Aransas-Wood Buffalo Population, named for the wintering grounds at Aransas Bay on the Gulf Coast of Texas. This population is slowly growing, now at about 320 birds. Biologists decided to reintroduce additional flocks back into the historic range of the species. Through captive breeding, various reintroduction techniques, and intense research and monitoring, conservationists have established two reintroduced populations. One is a non-migratory population in Louisiana, established in 2011, where historically whooping cranes had been found all year round. The other is known as the Eastern Migratory Population (EMP), which was established in 2001, and now has about 109 birds. Whooping Cranes in the EMP spend their summer on breeding territories in Wisconsin. Starting in October, they start to head southeast. At the inception of this project, biologists thought that EMP flock would winter in Florida. But many of them have been stopping short. Indiana provides vital habitat for both migrating and wintering whooping cranes, with Goose Pond State Wildlife Area being the most important spot in Indiana for the species. The mix of agricultural fields and shallow wetlands at Goose Pond provides ideal habitat for both whooping cranes and their much more abundant relative, the sandhill crane. 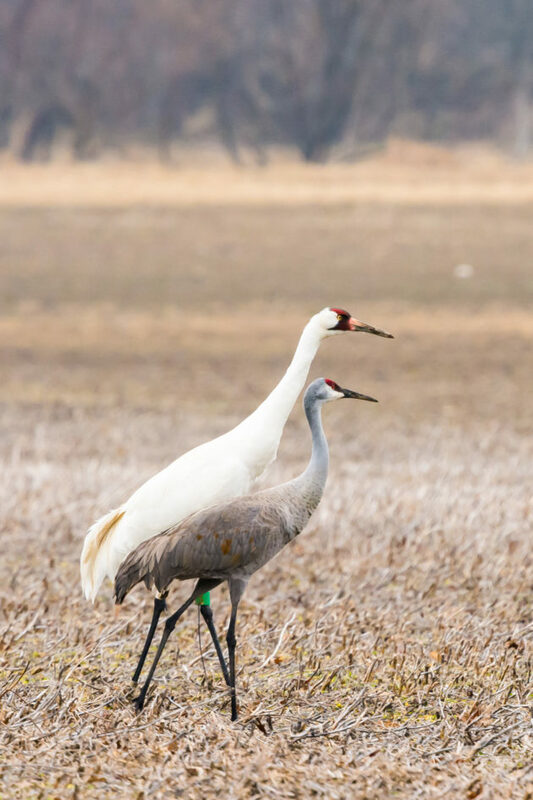 Sycamore Land Trust has played an instrumental role in the creation and continued expansion of the property, and whooping cranes are loving it. In the winter of 2016-17, 34 individual whooping cranes were recorded at Goose Pond or in the surrounding fields, representing about 31% of the EMP. I saw my first whooping crane when I joined the International Crane Foundation (ICF) in 2010 as an education intern. My job was to give tours of our headquarters in Wisconsin to schools and the public. I even got to wear a crane caretaker costume, a white tunic with a mesh panel for me to peer out of so that the whooping crane chicks would not imprint onto the human form. Once, a wild whooping crane mistook me for another one in its territory, and I found myself face to face with a five-foot-tall bird that was threatening me with the red patch on top of its head. One of our professional aviculturists, dressed in a crane caretaker costume, stepped between us and walked toward the wild whooping crane until he got the message and backed off. It was both a thrilling and terrifying experience. I knew I wanted to work with this species again. After graduate school I landed back at the ICF as their Whooping Crane Outreach Coordinator. My job is to raise awareness about whooping cranes in communities where they occur across North America, including southwestern Indiana. Sounds easy, right? Sycamore members are likely aware of the story of the whooping crane, but our research through surveys and focus groups indicates that the general public has a very low level of knowledge and awareness about them. Unfortunately, this has led to some terrible consequences for the species, such as shootings. Indiana has the highest number of whooping crane shooting incidents in the EMP. Two of these shootings have occurred in the Goose Pond area, both on nearby private property. Hunters are not the problem. The majority of whooping crane shootings are completely unrelated to a hunting season, but are instead done by vandals. Whooping cranes are tall, white, and live in open habitats, often visible from a road. This makes them easy targets. The ICF is launching a campaign in Indiana to change this. Our outreach plan includes working with Indiana organizations such as Sycamore Land Trust on K-12 education, media campaigns, presence at gun and hunting shows, hunter education, and support of the Marsh Madness Festival at Goose Pond. As a supporter of Sycamore Land Trust, you can help us by spreading the word on whoopers through conversations with friends and family and through social media. Please follow the International Crane Foundation on Facebook to learn more about how you can help.